Do you have an iPhone or iPad App? We do, and the app is available for download here. 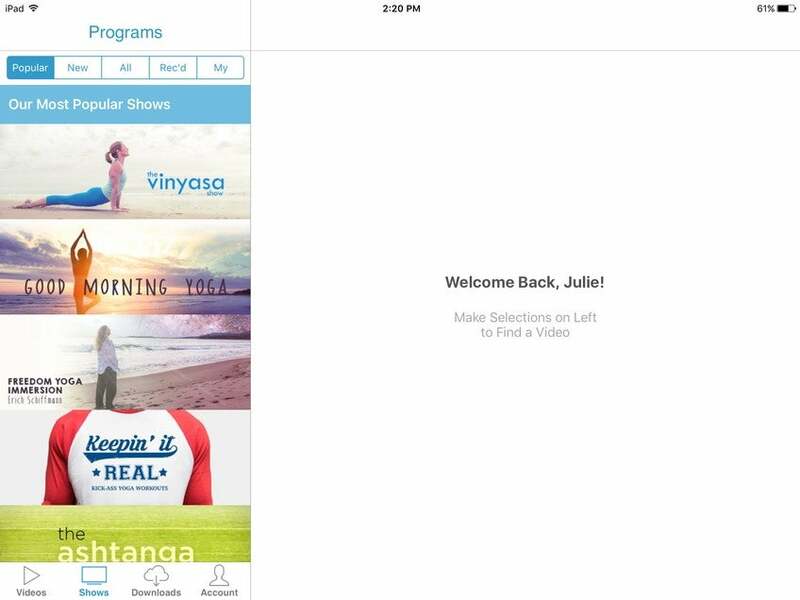 You can also go to the App Store on your iPhone or iPad and search for "Yoga Anytime Videos." 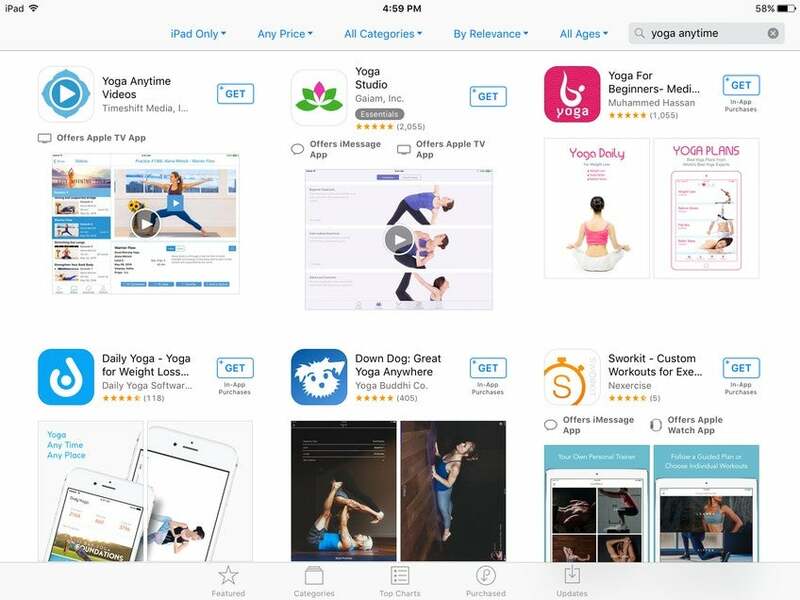 How To Install the App: Go to your App Store on your iPhone or iPad and search for "Yoga Anytime Videos." Once you see the blue Yoga Anytime logo, click the "Get" button. After you allow the app to download, you can click on the icon to open the app. 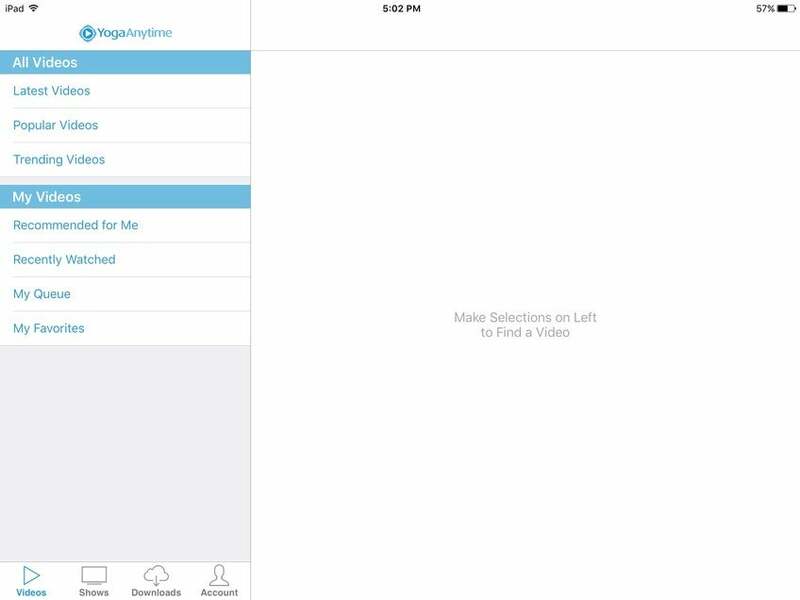 Below is an example of what our app looks like in the App Store. 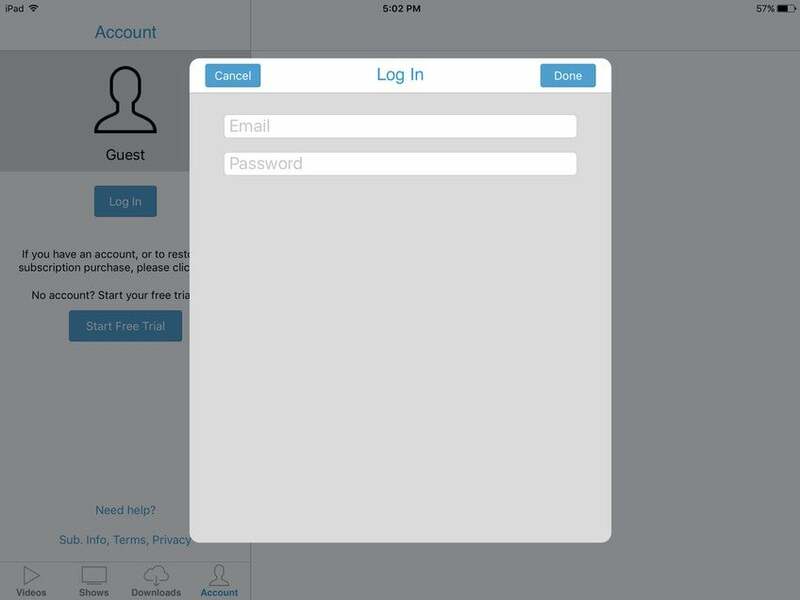 How To Log Into the App: If you created your original Yoga Anytime account on your computer or through your web browser on your iPhone or iPad, you will need to log in with your account information in the app. To do so, click the Account tab at the bottom of the screen. Click the blue "Log In" button and enter in your email address and the password you used to create your original Yoga Anytime account. Our system is case sensitive, so make sure that everything is entered in correctly. Note that if you are prompted to sign into the Apple Store using your Apple ID, you must press "Cancel" to access the Yoga Anytime App login page. Logging into your iTunes Store will result in creating a duplicate account. 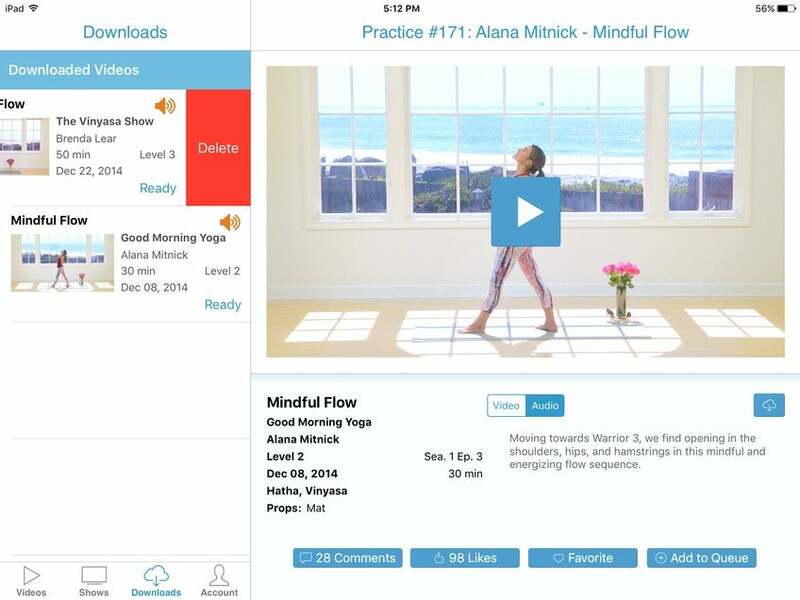 Accessing Our Videos: Once you are logged in to the Yoga Anytime app, you can watch videos by selecting the "Videos" tab or "Shows" tab on the bottom left side of the screen. If you click on the "Videos" tab, you will be taken to a new screen with two sections: All Videos and My Videos. In All Videos, you can see the preselected links we created: Latest, Popular, and Trending Videos. In the My Videos section, you can view videos that are recommended for you, videos you have recently watched, and videos that you have included in your "My Queue" and "My Favorites" playlists. 1. There is no search bar in the app, but you can search for classes using the filters. If you click on any of the links under the “All Videos” tab (i.e., Latest, Popular, or Trending Videos) you can click the "Filters" button in the top right with the magnifying glass to refine your search. After you click "Done," you will see all of the videos that meet your filter criteria. 2. The only playlists you can view in the app are "My Queue" and "My Favorites." Any playlists you have created through the website will not be available in the app, but you can easily add videos to your favorites or queue through the app by clicking either "Favorite" or "Add to Queue" under any video. Shows Tab: Click on the "Shows" tab on the bottom left side of the screen to browse our videos in the seasons for which they were filmed. Our shows are curated for specific needs to help you find the yoga practices and progressions that are best for you. Downloads Tab: You can view all your downloaded videos anytime by clicking on the Downloads tab at the bottom of the screen. This is a great feature for those who are traveling without an internet connection, or for those who have better access to data and higher internet speeds during specific times of the day. 1. Find the video you would like to download. 2. Click the blue cloud icon (the blue square with a cloud inside of it) underneath the video to download the video. 3. Make sure your video is complete before shutting down the app. How To Delete a Downloaded Video: While you can download a maximum of ten videos at a time, you can delete videos out of your downloads to swap them for other videos. To delete a downloaded video, swipe left on the video thumbnail and click the red delete button. 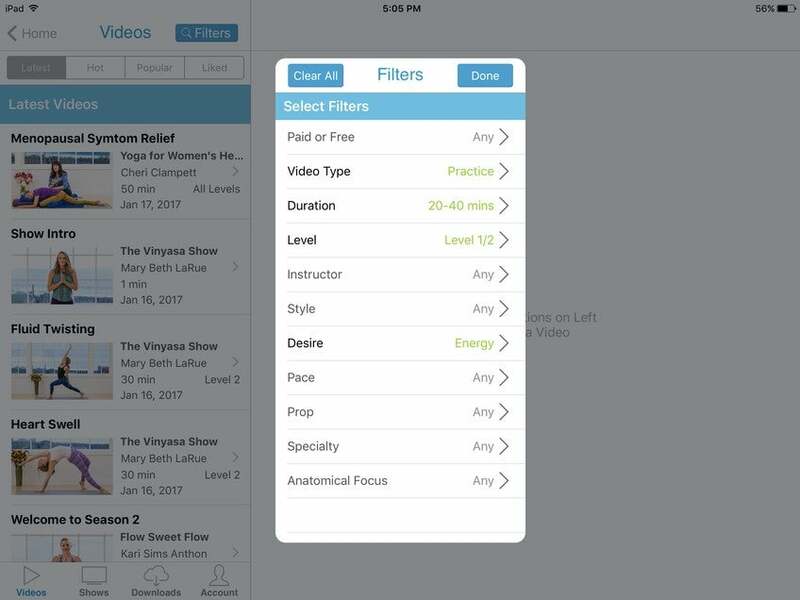 All of your downloaded videos will stay on your device if you are logged into the app and are a member of Yoga Anytime. If you log out of the app or cancel your membership with Yoga Anytime, your videos will be removed from your downloads. Audio-Only Feature: You can play videos in audio-only mode, like a podcast. This helps save data if you are reaching your data limit. To switch to Audio mode, click the audio button underneath the video. Once you are in this mode, click the blue cloud if you want to download the audio. To switch back to Video mode, click the video button underneath the video. After you have downloaded the app, we would be so grateful it if you could return to the App Store and give us a rating and a review. We hope you enjoy the Yoga Anytime app! Can I use a Wii to watch videos? How do I watch Yoga Anytime on my TV using Roku? How do I make the videos play on my Android tablet? How do I watch Yoga Anytime using Apple TV? How do I watch Yoga Anytime on my TV using Chromecast?